Light, fluffy and savory, these fritters combine healthy zucchini, zesty Parmesan cheese, and aromatic spices. Served top with sour cream as a side dish, meal or appetizer for an easy and delicious dish. in a large bowl combine flour, Parmesan cheese, oregano, salt and pepper. In medium bowl combine zucchini, egg, onion and mayonnaise. Stir into flour until well blended..
Preheat large frying pan over medium high heat and melt butter. Drop zucchini mixture by cupfuls into fritter and press lightly to flatten. Fry until golden brown, approximately 2 minutes on each side. Drain on paper towels and serve with sour cream. 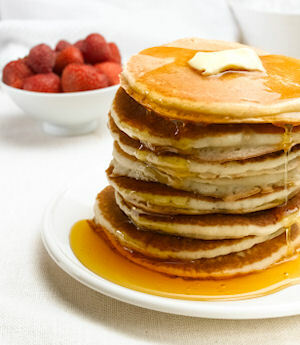 Back to the Pancake Recipes home page.